In the almost two decades after the end of World War II, the American economy witnessed a massive and sustained growth that reshaped American culture through its abundance of consumer goods. Standards of living climbed to unparalleled heights. All income levels shared and inequality plummeted in what some economists have called “the Great Compression.” And yet, American economic progress contained fundamental flaws. The new consumer economy that lifted millions of Americans into its burgeoning middle class also produced inequality. Women struggled to claim equal rights as full participants in American society. The poor struggled to win access to good schools, good healthcare, and good jobs. The same suburbs that gave middle class Americans new space left cities withering in spirals of poverty and crime.The Jim Crow South tenaciously defended segregation and American blacks and other minorities suffered discrimination all across the country. As the following sources suggest, the contradictions of the Affluent Society defined the decade: unrivaled prosperity alongside crippling poverty, expanded opportunity alongside entrenched discrimination, and new liberating lifestyles alongside a stifling conformity. John T. Bledsoe, “Little Rock, 1959. 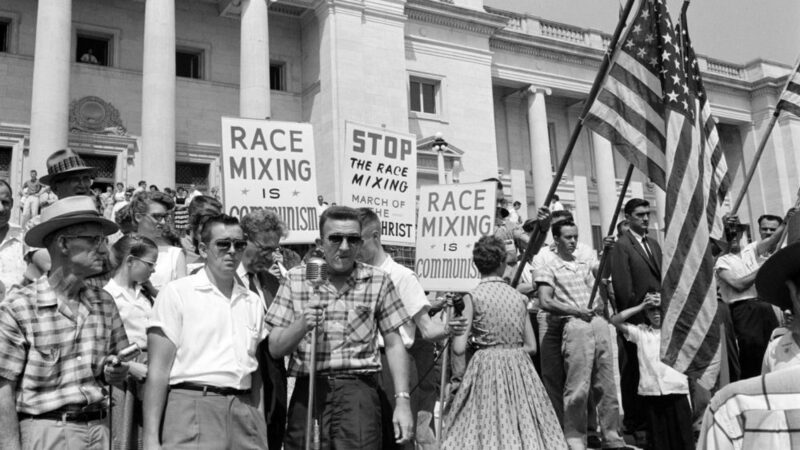 Rally at State Capitol” (Aug 20, 1959). Via Library of Congress. Redbook made this film to convince advertisers that the magazine would help them attract the white suburban consumers they desired. The “happy go spending, buy it now, young adults of today” are depicted by the film as flocking to the suburbs to escape global and urban turmoil.